My oldest child was born while my husband was deployed in the first gulf war. Our squadron’s support group organized dinners for me every night until my husband returned 4 weeks later. But that is not all. Whoever brought me dinner packed a lunch for me to enjoy the next day. Seriously. I have been paying that amazing gift forward for the last 20 years. I don’t like waste, but this is one time where I like to use disposable aluminum pans. Then the family I deliver a meal to does not have to worry about washing the pan or returning it. Put a large pot of water on to boil. Once it begins boiling add shells and cook according to the package directions. While the water is heating, cook hamburger and onion over a medium flame until hamburger is browned. Add taco seasoning, beans, and diced tomatoes. Be sure to add the juice from the diced tomatoes too. Simmer over low heat for for 5 minutes. Remove from heat aside and let cool while the shells cook. Once the meat mixture is close to room temperature, add 2 cups of cheese and mix well. In a small bowl, combine tomato sauce and salsa. Spoon 1/2 cup of tomato sauce mixture into each 13 x 9 baking dish. After the shells have been drained, spoon meat mixture into each shell and place it in a baking dish. After all the shells have been filled. Spoon 1/2 cup of the tomato sauce mixture over the shells in each baking dish. Sprinkle 3/4 cup cheese over the stuffed shells in each baking dish. Cover one baking dish with foil and bake at 350 degrees for 25 minutes. Remove foil and bake for another 5 minutes. If you are taking this to another family, you can cover the dish with foil and put the baking directions on a sticky note on top of the foil. This is also a great “cook one, freeze one” meal. If you are not taking a meal to another family, cover one baking dish with plastic wrap and freeze. 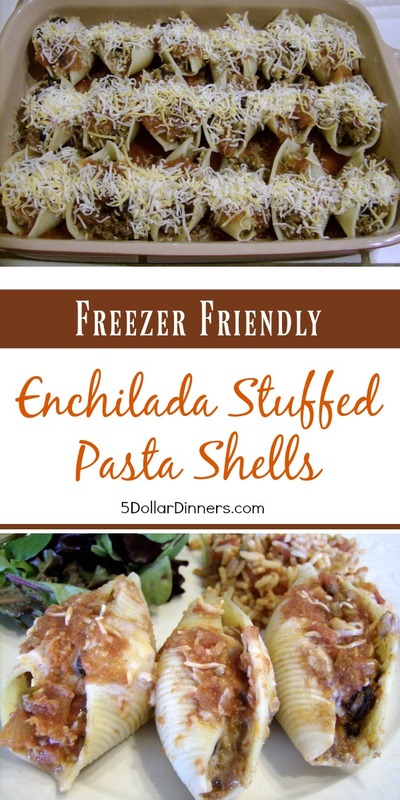 Defrost in the refrigerator on the day you want to cook the stuffed shells for dinner. Do you have a dish you share with friends when they are in need of a meal? Love this! I love having meals that make double so that I can freeze for future use (whether for my own family or another in need). Thanks so much for sharing it! Alea – these look wonderful! One of our family favorites is Italian Stuffed Shells. We will definitely be trying this variation! I think I even have all the ingredients on hand. I love the story of how your friends took care of you – with a lunch too! You are not going to believe this. I just delivered a meal tonight – in some disposable pans 🙂 Chicken and rice. Thanks for another great recipe. When I’m asked to make a dish for a new mom, I bring Chicken Divan. I bring it with instant rice so they can make it at their convenience. This dish reheats really well and I can make as much or as little as I need without a lot of recalculation. Okay…so where is the enchilada taste going to come from. Sounds like taco bake to me. Perhaps if I substituted a can of enchilada sauce instead of the tomato sauce? My family isn’t big on “speghetti” dishes but this isn’t quite the same as that taste so I think I will give these a try. I made this for dinner last night. So good! I was surprised how easy it was to make. The extra pan means I don’t have to make dinner tonight! I was even able to easily feed to unexpected dinner guests with no worry of if there would be enough food. I have a pan in the oven right now and I think it’s going to taste really good, but the shells just fell all apart while I was trying to fill them. It was a big mess! I think I just cooked my pasta too long. But I’ll definitely try it again because the meat mixture tasted great! And as a bonus, I made them in the smaller pans from Dollar Tree (the package says 2-1/4″ oblong pans) so I got our lunch today plus 2 freezer meals. It’s just Sweet Hubby, our toddler and I, so that’s plenty for us. We are having these tonight. I sampled as I went along and so far so good! I just have one request, though. Is there anyway that you could put the nutritional values up with the recipe? My teen is a Type 1 diabetic and I have to know the carb count for her food. Usually I can type a recipe in a recipe calculator but am having trouble with this one because of the pasta shells. I make a conscious effort to look for recipes that already have the values listed for the sake of ease but can’t pass up your delicious dishes! Thanks for all the great recipes! We use quite a few of them! Yum! I have everything to make this for dinner tonight. I will be feeding my family of 7 it tonight. Looks and sounds good. I just can’t get my head around ‘italian’- noodles to go with tacos? Do they taste spaghetti-ish or taco-ish? I love the big recipe idea…Thanks! They taste tacoish. I enjoy combining elements from different cuisines to create surprising flavor combinations.